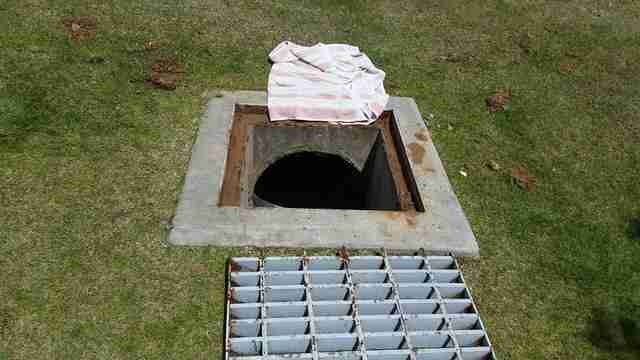 When Trish Favela was dragged over to a storm drain by her dog Willow, she had no idea why until she saw three little faces peeking out from beneath the grate. "I saw a mom and two babies, meowing and hissing, who were angry that a dog was looking at them," she told The Dodo. Willow, a rescued female chow and yellow lab mix, was obviously concerned. "Her mother instinct came out," Favela said. "She looked up at me as if to say, 'Get them out of there.'" Favela tried in vain to lift the grate but it was too heavy. She began making phone calls to some animal rescues that said they didn't have the capabilities or resources to help. Because she lives in a private, gated community, it is difficult to get the fire department to come out unless it's an emergency, and calls to other groups ended the same way: Either they couldn't help or they said the cats were not at risk. However, Favela was concerned because of a storm threat in the Phoenix, Arizona, area where she lives, and if that happened, the mother and kittens surely would drown. She called her daughter and told her how worried she was about not being able to find help for the cats. When Favela's daughter got home that night, she tweeted the information and posted on Instagram about the cats being in danger. A flood of phone calls started pouring in with suggestions and people offering to help. "That's how I found Peaches," Favela said. Peaches Sloan is an independent rescuer who just started working with Echo Canyon Equine Foundation in Phoenix. Somehow Favela's plea for help reached Claudia Pape Schalk, founder of Echo Canyon Equine, who posted it on Facebook. Someone tagged Sloan, who then sprang into action. Sloan arrived at the site the next day, and with help from the superintendent of construction for the gated community, they lifted the storm drain grate. 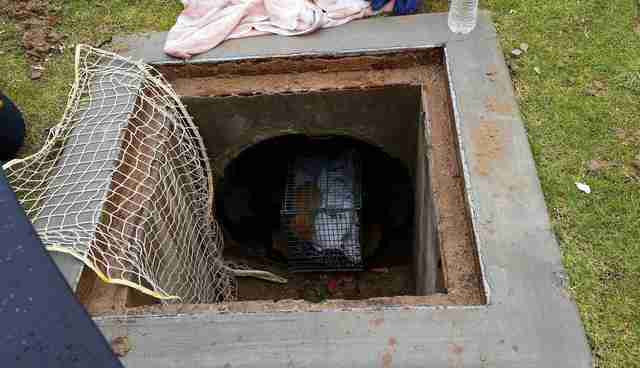 Peaches set up a Tru Catch humane trap and lowered it into the storm drain. They waited for hours without luck. 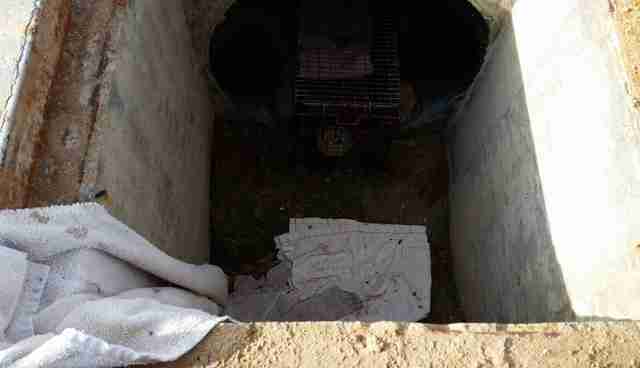 With permission from the superintendent, they left the trap inside the drain, the grate slightly ajar and a towel draped down into the retention area so the cats could get up the side of the towel if it rained or flooded. Sloan returned the next day, set the trap and, within 10 minutes, she had the mother cat. "Then I knew I had to use the mother as bait to set a trap for the kittens, but I didn't have space for another trap to fit there," Sloan told The Dodo. "I had to flip her trap up sitting on end, but I had a nice towel in there for her." Lisa Bogart, another independent rescuer, showed up Saturday to help. Sloan placed a baby monitor down in the drain. "We had the other end of the baby monitor in Lisa's vehicle observing and listening," Sloan said. 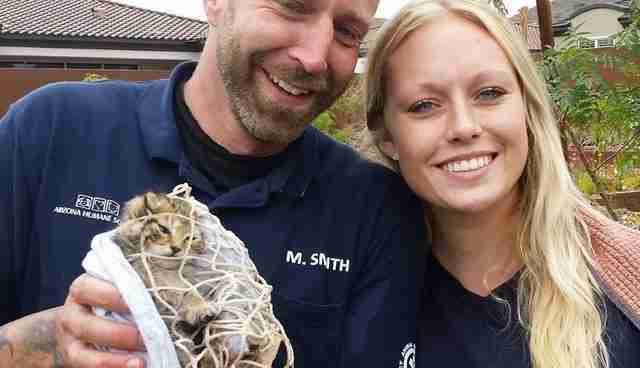 They stayed until 3 a.m. while the mother cat was still in the trap. Sloan took the mother cat home with her and planned to come back the next day to try again to get the kittens. "I knew we were going to have to get in that storm drain," she added. The next morning, Sloan received a frantic call from Favela that it was pouring rain and the storm drain was flooding. Sloan immediately headed back to the site, about 30 miles from her home. She texted another rescue friend and asked for more backup. 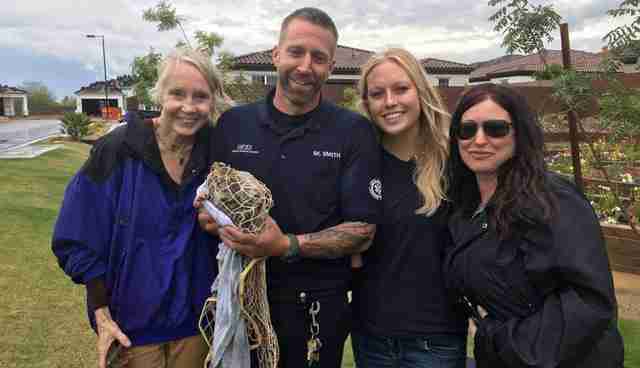 She also called the Arizona Humane Society (AHS) to dispatch a rescue truck. "I was the first person to get there and the storm drain that we suspected the kittens were still in was not raging water yet, but the other drains were," Sloan said. "Trish and her husband had pulled the metal grate off, and we couldn't see the kittens but we could hear them." They had no idea where the end of the storm drain was and were trying to find it. "You could see light at the end of the tunnel, we just didn't know where that was," Sloan said. That led them to remove the manhole cover to see if they could spot the kittens from the other side. 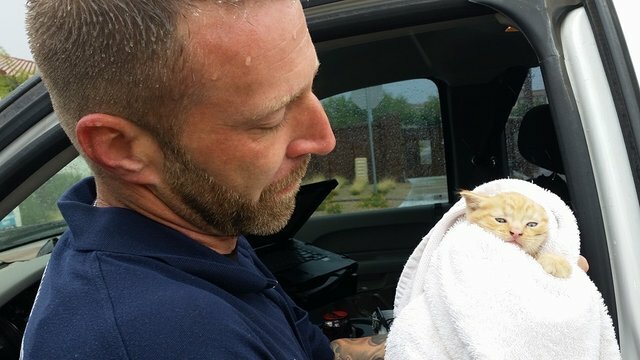 When they removed the cover, Mark Smith, an emergency animal medical technician with AHS, said he could see the kittens who were about 15 feet away. However, he couldn't fit into the drain. She went in wearing welding gloves and carried a net with a handle. "So I went into the manhole, and [Smith] shined a flashlight to guide me so I could see, and I saw [the kittens] were actually about 50 feet away," Sloan said. "I couldn't even crawl. There wasn't enough space, so I had to worm my way like a Slinky in the manhole cover area, and then eventually I started doing a cobra pose, just pushing my way getting closer and closer." When Sloan reached the kittens, she realized she couldn't grab both. She grabbed the orange kitten, who tried to bite her. Sloan realized the net wouldn't work in that situation. She just had to get the kitten out and come back for the other. "I put the first kitten between me and the end of tunnel and, on my back, I scooted this kitten inch by inch with my feet because the kitten would not budge. He froze!" Sloan said. By the time she was toward the end of the tunnel, she heard someone say it was pouring. She knew she had to hurry so she could go back for the second kitten. However, it was difficult to breathe because the silt was making the air dusty. She forged ahead with kitten in hand, placed the kitten in the net and then passed him over to Mark. Then the water started to come in. 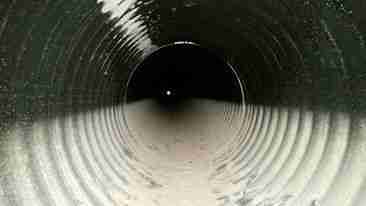 She got out, and they rushed back to the storm drain where it had not yet started to flood. 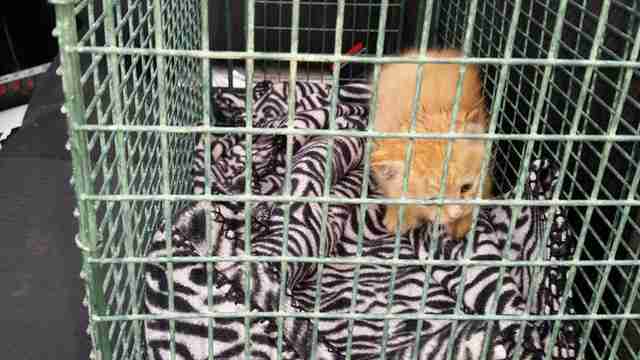 They took the first kitten and placed him in a small cage in the retention area. "I lowered a net to be ready to grab the next kitten in case we could lure him to the sibling, and it worked!" Sloan said. "So I literally dove in to throw the net over this little kitten. I scooped him up and lifted him out with the net. At that point I looked like an upside down jack in the box, and somebody had to pull me out. I didn't have the strength to back out at that point." Sloan was drenched and cold but was happy about the outcome. 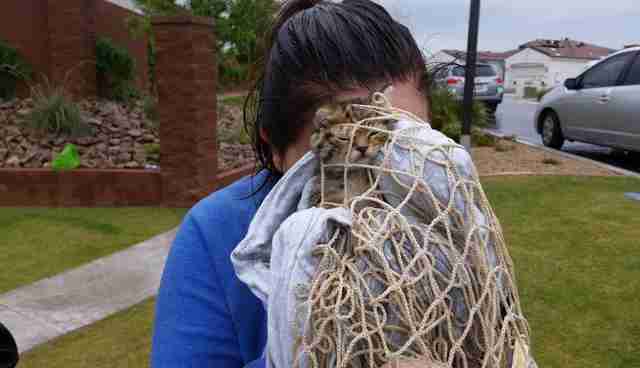 "It was a pretty exciting rescue," she said. She took the kittens to reunite them with their mother at her home, where they are safe and healthy. The mother is about 10 months old and the kittens are about 6 weeks old. Everyone will eventually be assessed, and spayed and neutered. 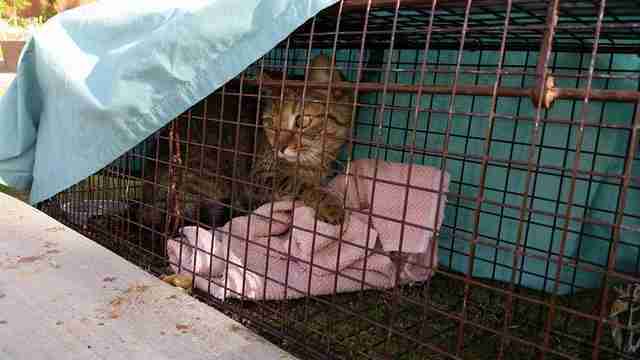 Throughout the rescue, Sloan told herself to breathe and be calm in order to get through it to save the kittens. "Mark was straight behind me shining the flashlight at the entrance to the storm drain and was my emotional support," Sloan said. "He kept saying not to worry and that he'd stay with me." Favela stood by through the entire rescue that day and was surprised and amazed by the dedication of those involved. "They were not thinking about their own safety; they were thinking about the animals," Favela said. "It was very heroic to me. Those kittens would have definitely drowned. To see there are rescuers out there who want to help, and that do everything they can with limited resources is pretty amazing."